Disclaimer: I like spiders. Actually, that may be an understatement: I am enthralled by them. I completely understand if you’re not quite as captivated by the eight-legged critters; and Nora, if you’re reading this, I know you’ll never come around. But if I can change the mind of just one reader, I will be happy. I took this picture about 3 years ago. 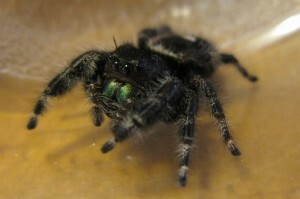 It’s a jumping spider in the Phidippus genus. Widespread across Canada and the US, it had been spending its days in an old shoe sitting on the back step and I encountered the curious face of this arachnid every day for a week. When my mom wanted her shoe back, I took it upon myself to find this little guy a new home. But not before snapping a few pictures first. Who could resist a face like that? Jumping spiders are a unique type of arachnid: as their name implies, they can jump. How far? Up to 50 times their body length, which converts to about 2 feet. If we compare that to a human, take my height of 5’6″, for example, I would have to jump 275 feet to be comparable to the distance a jumping spider can reach. The immense power used to launch them these distances comes from their back legs. The back two sets (four legs) are not muscular, nor do they have the ability to fully extend. It is thought that jumping spiders use a sudden rush of blood to these legs allowing them to extend rapidly. And they’re quick: using short- and long-distance jumps to escape predators, catch prey, or just to get from place to place. Like most spiders, jumping spiders can have eight eyes (some have six). The two largest eyes face forward and are moveable; the rest, whether they face forward or to the sides, are fixed. With these eyes, the spider can see almost 360 degrees around itself. Unlike many spiders, the jumping spider does not build a web. Take all of your spider knowledge (likely garnered from the incredible Spider Man) and throw it out the window. These fascinating creatures stalk their prey. Once the potential meal has entered its visual range, it begins a strategic plan, aligning its body and moveable forward-facing eyes (known as the anterior median pair) to face the object in question. It will study the object, deciding its chances on winning a potential battle. Using a ratio of focused images to unfocused images, the spider can judge how far it must travel to reach its dinner. Then, without warning, the prey is within the clutches of its predator. Delivering a strong bite, filling the victim with its deadly venom, the spider can rest peacefully with its meal. I should mention that jumping spiders do have the ability to make silk. Instead of using the material to build webs or cocoon their prey, they use it like a tether. If there is a possibility of falling any distance, the spider will secure itself to something stable and jump without looking back. The venom injected by a jumping spider is not enough to cause any lasting damage to most people. In all likelihood, if you’ve been bitten by a jumping spider, you were provoking it. They are docile creatures and generally good judges of their opponents. If you have been bitten though, you may notice some redness and swelling around the area. Wash well and use an antibiotic ointment. Should you experience symptoms any more serious than this, you are likely allergic and you should see a doctor. Ontario has two known species of poisonous spider: the Brown Recluse and, more recently, the Black Widow. It’s important to be able to recognize these two spiders and know what to do should you or someone you’re with be bitten. If you’re an avid outdoorsy type, get yourself a pocket book. Spiders, in general, are a good thing to have around: they’ll eat up those mosquitoes and other annoying summer bugs. Plus, jumping spiders have even been known to attack and devour the Brown Recluse. Jumping spider infestations in the house are rare but, if they do occur, can be a problem that should be taken care of by a professional. If you have one lonely spider inside, you can leave it be and it will go on with its life without bothering you. If you simply cannot go on with your day knowing that there is a spider inside, have it moved outdoors. There’s no gain in killing it. Finally, if you encounter a jumping spider, conquer your potential fears and spend some time with it. Watch it jump and stalk its prey. Watch it watch you. That’s right, jumping spiders will watch you; they will turn their heads, giving you that curious look your cat or dog may give you. For me, it was their personality that caught my attention: their bold stand-offs, inquisitive looks, and overall sense of intelligence I felt while sitting with them on the back step. As spring enters our little area of the world, notice the little creatures that begin to emerge from their winter retreats and think twice before squashing them. DON’T FORGET… SNOWSHOE EVENT FAMILY DAY: Join us for a Snowshoe Saunter on Family Day Monday, February 17, 2014 for a FREE fun day of snowshoeing at SCOUTS VALLEY (Line 15 lot) 10am – 3pm. One hour guided sessions. Have snowshoes? Bring them along but no worries if you don’t, Kids for Turtles has many sizes of snowshoes. Light lunch and beverages provided. Kids welcome. Written by: Marette Sharp, a volunteer with Kids for Turtles. Kids for Turtles Environmental Education is an educational and outreach organization working to bring a better understanding of and stewardship to the environment around us.